Sometimes all you need a bread bowl full of cheese. It’s been one of those weeks. All the activities, events, and excitement of the last couple of weeks have finally caught up to me. Half marathon, Coachella, Boston. I’m pooped and exhausted. I can’t wait for the weekend to begin. 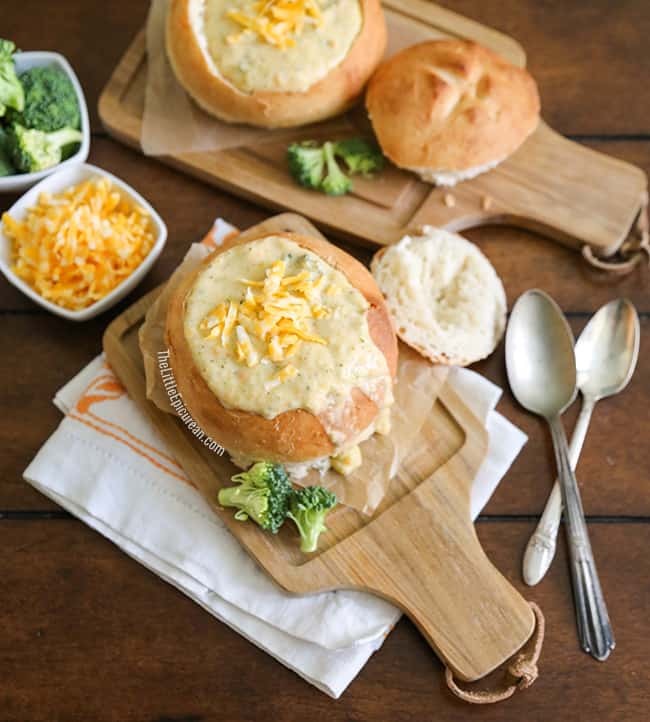 I’m kicking off Friday night with this super easy one pot cheddar broccoli soup. Believe it or not, my favorite cheddar broccoli soup comes from Disneyland. They serve it in a sourdough bread bowl from Boudain Bakery and it is amazing. Mind you, I usually have to take two Lactaid pills to enjoy the soup. I don’t care. It’s the excess number of calories that I worry about. My homemade version is a tad healthier. I use the tiniest amount of heavy cream possible, just enough to make the soup feel rich and creamy, but not so much that you need to add an extra notch to your belt. I used a combination of heavy cream and whole milk, but you can substitute 2% or lowfat milk if you’d like. If you go for a lighter milk, keep in mind that the soup will not be as creamy. However, you can make the soup feel “thicker” by adding a little more broccoli and carrot. The broccoli and carrots add a nice body to the soup once pureed. To make the soup vegetarian friendly, simply substitute vegetable broth for chicken broth. This quick and easy soup needs a quick and easy homemade bread bowl. Last December, I participated in the Baking A Difference campaign with Fleischmann’s and Karo. Fleischmann’s supplied me with a sampling of their Simply Homemade No-Knead Bread Mixes. I loved them all, especially the pretzel! Some people may call it cheating, but I still call it bread-making. Just because it comes from a mix, doesn’t make it any less homemade. 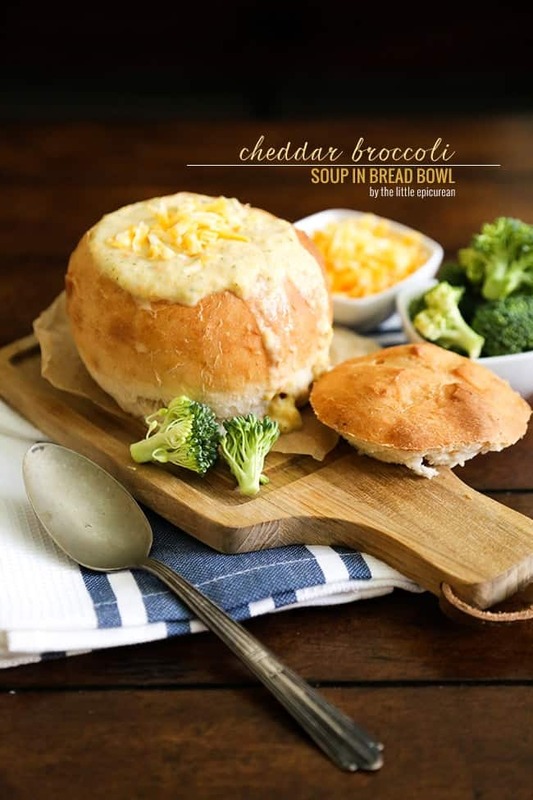 It’s ideal for lazy nights like these…and this cheddar broccoli soup is just begging to be eaten in a bread bowl. I used the Country White bread mix. The mix makes two bread bowls, perfect for me and Alex! Now it’s time to kick off my shoes, enjoy my cheddar broccoli soup and catch up on this week’s episode of Game of Thrones! This super quick and easy one pot Cheddar Broccoli Soup is just what your dinner needs. 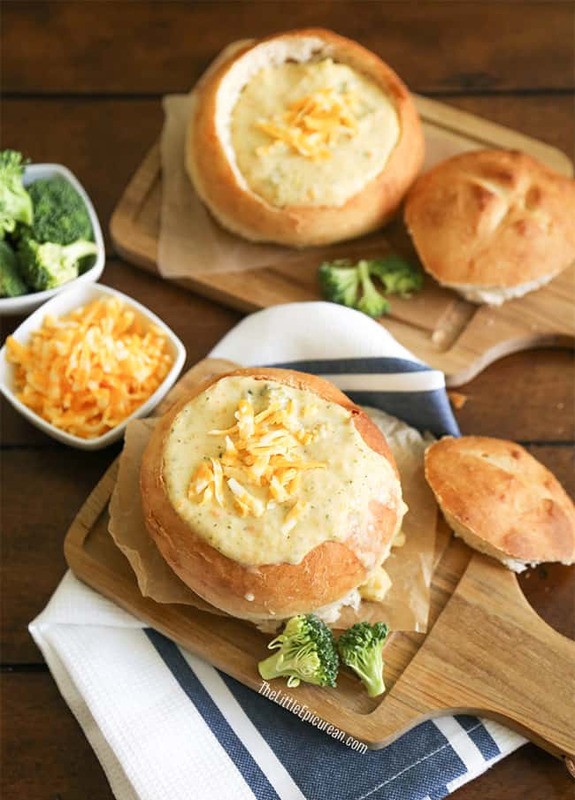 Make it special by serving the creamy soup in a bread bowl! In a large pot, melt butter over medium heat. Add onion and garlic. Cook until onion is tender and almost transparent. Add milk, cream and chicken broth. Add carrots and broccoli. Bring to a boil, reduce heat and let simmer for 15-20 minutes until carrots and broccoli are tender. Puree about 3/4 of soup in batches in a blender until somewhat smooth. I like to keep 1/4 of the soup chunky with whole bits of vegetables. If you'd like, you can puree the entire soup for a smooth finish. Return puree back into the pot. Alternatively, you can use an immersion blender in the pot. In a small bowl, whisk together cornstarch and water until smooth. Add slurry mixture into the soup pot and stir to distribute. Bring soup to a boil to a cook out cornstarch. Remove from heat. Add shredded cheese to soup. Stir until cheese is melted. Season soup with salt and pepper. Ladle soup into bread bowls. Garnish with additional cheese. This looks soooo good! Very creamy and filling. The bread bowl is definitely a must! I can’t wait to try it! Pinned. I really like your unusual idea of using hollowed out bread rolls for the soup bowls. I think you could probably use small uncooked pumpkins/squashes or the base of a butternut squash in the same manner. Soup served in these lovely bowls would definitely be a ‘ talking point ‘ ! It would also be ideal for a bonfire party or barbecue ( you could use them as salad bowls ). Now, I just need to think of something that I can use to carve a spoon from! No more washing up!!! Your Pin button doesn’t work! Arrrgh!! How long does it take at a boil to cook out the cornstarch/slurry? Let mixture boil for 20-30 seconds to remove unwanted cornstarch flavor. Your pin and save buttons don’t work!